Independence is what being a Provider is all about. Americans don’t realize just how dependent we are on large corporations for one of the most basic and essential needs for life – food. Our food supply is carefully managed and controlled, with the power over it concentrated in only a few hands. Production is carefully controlled by just a few large corporations, processing and distribution by those same corporations, and the retailing by another small set of corporations. A good overview of just how tightly controlled our food supply is can be found in an upcoming article that will be called “How Food is Produced”. Over the entire supply chain stands the government which controls it all. New legislation is in process this year to increase corporate control over the food supply even further. If passed, it will eliminate the last of competition from independent producers – leaving only the gigantic corporations in control of it all. 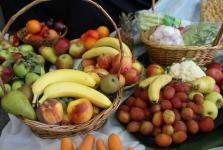 Under its provisions, not only will it be illegal to buy food from alternative producers (i.e. small farmers), but also illegal to buy from alternative suppliers (e.g. co-ops). It will even be illegal to raise or store food in your own home. However, that aspect of the legislation will be difficult to enforce. So what should we do? Should we just buckle under and eat soylent green? Since control of the entire food chain is in the hands of just a few, can such a prospect be far behind? Even the supply of seed is controlled by just a few, and since more varieties than ever are hybrids, it is even more difficult to get seed that is not controlled than ever before. Imagine how such power could be wielded. The few entities can decide who gets to eat what and how much. Do you really want to be that dependent? It wasn’t that long ago that millions were starved to death by their own government. Regardless of the costs in terms of inconvenience and even risk of breaking the law, don’t you want to be in control of your own food supply? The way animal based foods are raised is not only inhumane, but unhealthy – not just for the animals, but for us. Their feeds are often unnatural, despite what the label says. Of course, everyone knows about the rampant drug use to keep these sickly animals alive. Since you are what you eat, it is no wonder heart disease, diabetes and cancer are epidemic. Not only are industrially produced animal foods bad for you, but industrially produced produce is as well. Pesticides are not even the biggest problem. A bigger problem is the lack of fertility in the soil which is masked by the use of artificial fertilizer. This lack of soil fertility results in produce that has very little nutrition. Don’t think buying organic will help you either. Industrial organic food can be just as poor quality – see The Ominvore’s Dilemma. Now for all this talk about meat and produce, let’s not lose sight of the fact that what most people eat is not even these real foods, but manufactured ones. Most of the grocery store is filled with manufactured foods. Whether it is a snack food or breakfast cereal, just look at the ingredients. You will find just three main ones – white flour, white sugar (or worse – corn syrup), and soybean oil. The rest of the ingredients are just for flavoring and texture. So even though the food may look real and each product distinct, it is all the same sickly mash. This stuff will frankly kill you. If you want to be healthy, you must learn to provide your own food. It is fine and good to buy from small farmers and other producers while you can. In fact, you should do everything you can to keep them in business. We can’t do it all, and the more we can help each other, doing what we are best at ourselves the better. Such specialization is not contrary to the Provide Your Own spirit, but complementary. We want interdependence on our neighbors. What we don’t want is utter dependence on multi-national corporations; especially for our food. In providing our own food, we must also not just think in terms of production, but processing and preparation as well. We should learn the old skills – how to butcher meat, preserve the produce of the garden, and prepare our own food for the table. We should quit buying the manufactured junk in the grocery store and learn how to make many of these things ourselves. Only then can we control the process and the ingredients and ensure healthy food for our families. It will likely be more expensive to produce your own food, than to purchase manufactured stuff. Factory farms exist for a reason – to make food cheap. This cheap food is not without much higher costs in terms of health however. You get what you pay for. When you produce food yourself, you control the quality. Certain varieties of vegetables are bursting with flavor lacking in the industrial varieties. By nourishing the soil, produce will be sweeter, more flavorful and packed with nutrition. Pastured animals provide meat, dairy and eggs filled with color and bursting with flavor. When you experience foods the way they were meant to be raised, you will be amazed at how tasteless industrial foods are. They are really little more than flavored cardboard – in both taste and nutrition. Eating has been said to be an agricultural act. There is more to eating than just putting fuel in a machine. Sitting down to a meal together is a special event. It brings people together. The fact that most families no longer eat regular meals together is just one of the reasons why families don’t stay together anymore. Families who want to stay together, need to eat together – at least once a day. When you sit down to eat a meal made by your own hands, and if possible grown by your own labor, it brings an inner warmth that cannot be described. Words are utterly lacking here, so there is not much more I can say. You have to experience it yourself to know what I mean. When you eat such meals with those you love, you are truly living. You are not just a machine refueling. You are experiencing life at its finest – the gift of God. Build a Pantry – you need to have a store of your own food. Harvests come only once a year, so food that can be stored than long should be stored in quantities that will last a year, preferably two. This kind of storage takes room. Make a place in your home or add on a room or outbuilding. Provide for goods that are dried, canned and frozen. Plan a Garden (then plant it) – decide on a sunny location in your yard. Plan it out. Figure out what things you want to grow most. If you don’t have a yard, you can garden in tubs or hydroponically. Do some research; figure out a plan. Order Seeds – once you have your garden planned out, it is time to order seeds. This is no small task the first time. Get some catalogs from some good suppliers. I recommend Pinetree and Baker Creek. Do some research. Get some gardening books and other books on food production, processing and preservation. Build a hen-house. You’ll want some eggs. There is no finer food on earth, except for milk. Even if you don’t have any land, you can still keep a few biddies. There are even ways to get them the needed greens to produce flavorful eggs. Locate farmers where you can get some raw milk. Visit realmilk.com for more info. Be forewarned however. Real milk producers are under persecution. Early morning raids are often made on homes and farms. These are pogroms, just like those perpetrated on Jewish populations in Russia. The handwriting is on the wall. This essential food supply is soon due to end. Make friends now, and support them dearly. They will be your only hope of getting this vital food in the future. This list could go on and on, but those are a few ideas. Just make sure you do something. When you get up from reading this article – take action. Don’t put off for another day. In these perilous times, another day may never come. Act now. Act quickly. Act decisively – before it is too late. Why Provide Your Own Food? by Provide Your Own is licensed under a Creative Commons Attribution-ShareAlike 4.0 International License. This entry was posted in Food and tagged alternative health, food, food safety, health, organic food, security. Sections: Article, Featured. Bookmark the permalink. Both comments and trackbacks are currently closed. I know from the delicious, nourishing foods you provide that you know what you’re talking about here! I applaud your effort here, and am confident there is an audience for it. My husband and I have a garden and a few laying hens – raising your own is quickly addictive! We love making and providing for ourselves – my husband loves building just about anything he has an excuse to, I cook and lacto-ferment our food following Nourishing Traditional ways, and sew. We are working on deepening our independence, and dream of milking our own cow someday sooner than later -we live in Ca, so we have really developed a taste for delicious real milk that we buy through a co-op. The milk thing has been bothering me for a few years now. A couple years ago I started making my own cheese. I only had marginal success getting a clean break using store bought pasteurized and homogenized milk. I naively began the journey to fresh milk. I was having difficulty finding fresh milk. I could not believe it. I called the local county extension office to locate farmers that had the milk. I explained what I was doing and the difficulty I was having finding raw milk. I was then informed that it was AGAINST THE LAW to buy raw milk. I couldn’t comprehend what I was hearing. We have a TG Lee plant near my house so I asked the nice person how they got milk. Did TG Lee only buy processed milk. I was told that TG Lee was allowed to buy raw milk. Now I am fuming mad at this point and trying to contain my anger as not use fowl language with the nice person answering all the questions. Next I asked if she had heard of the supreme court (lower case intentional, contempt) ruling identifying corporations as citizens which allowed them to donate unlimited funds to political campaigns. I mean if TG Lee is a person and people are not allowed to buy milk then it is illegal for TG Lee to buy milk like all of us other people. Since then Florida passed some BS law saying farmers can sell raw milk if and only if it is clearly marked as “for animal consumption”. This is a cop out law. I am perfectly capable of processing my own milk if I desire, and if I do not desire it certainly is no concern of law makers or law enforcement. I am still just so damn mad I can spit nails. Anyway, nice article. I know how you feel – I have been there. Raw milk is just one of the many ways that certain corporations control our lives because they fear the threat of competition. The dairy industry knows they have an inferior product that they can’t improve, so they aggressively target anyone producing a better product. If it helps, understand that we are governed by rules, but not necessarily laws. Only in the natural world are we governed by laws. In the kingdom of men, we are governed by rules of behavior that are often capricious and trite. Much of the time these rules are invisible, so the behavior we observe makes no sense. In the realm of health foods and products, the rule of “kill the competition” is the main one operating. It trumps any laws that may be on the books. Laws and regulations only exist to serve the powerful. They do not serve the people except in rare instances. That reason alone is why you can’t buy raw milk. It has nothing to do with public safety. You listed some good seed companies where you mentioned the importance of food independence and taking action. Maintaining genetic diversity in the crops we consume is so incredibly important and I feel it is all too often overlooked from a consumers point of view. Planting your own vegetables from seed creates the opportunity to choose varieties that are not only unique to the average choices available to the consumer, but often times far more tasty! I recommend checking out sustainableseedco.com if you are looking for a huge selection of heirloom and organic seeds to choose from.